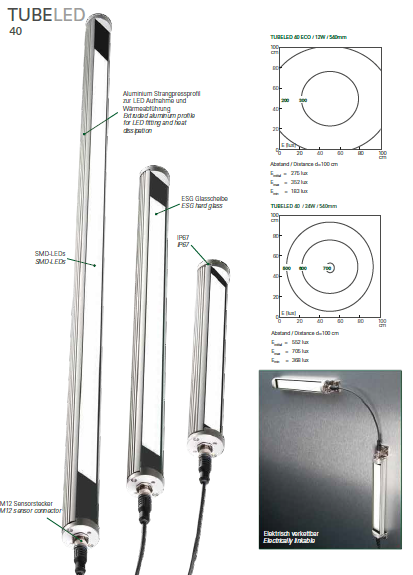 The TUBELED_40 is optimally suitable for harsh production en- vironments due to its oil-resitance and crack-resistant tempered glass. With a luminaire diameter of 40mm, the TUBELED_40 literally nestles against the machine surface and can be installed in particularly confined spaces. For micro-precision machines, punching presses, eroding machines or any installations with confined available space at the same time as harsh production environments, the TUBELED_40 is the required solution. With its special aluminium casing it is also fully operational at ambient temperatures of up to 40 degrees / 60 degrees.